Jon Renau Fame! This airy, short, straight style tapers smoothly to the neck. 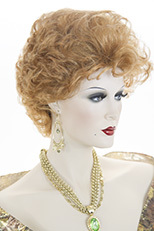 Weighting under 1.5 ounces with ultra thin Mono Lite construction, these 100% hand tied wigs are the lightest available anywhere. Chic and sophisticated! 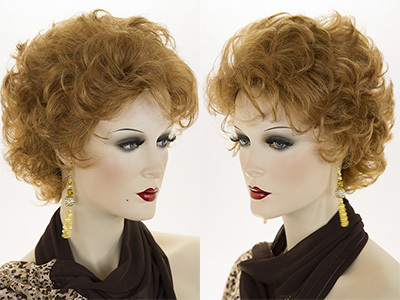 Short straight human hair wig with bangs and layers which taper and hug the nape of the neck. See item details for available colors. 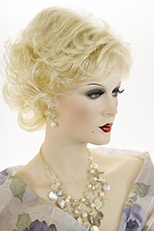 Short slightly wavy pixie style wig! This chic style is perfect for any occasion! See item details for available colors. Jon Renau Anne! Posh meets practical in this elegant short style. 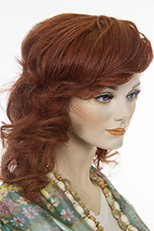 Heat friendly HD fiber, a lace front and a hand tied monofilament cap achieve an ultra natural look and feel. Arty, youthful and chic! Short, straight, edgy, tapered cut with point-cut layers. See item details for available colors. 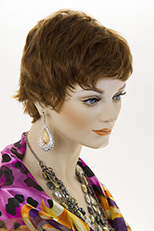 Short, chic, straight salon cut style wig! Length on top to the ear and tapering in the back. 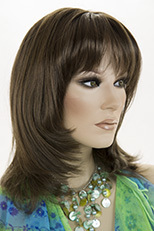 Featuring a hand tied monofilament top, for an extremely natural look and more versatile styling options. This gives the appearance of the hair growing right out of your scalp and the part can be moved in any direction. The monofilament top is 5 X 5 inches in size. See item details for available colors.